Since we are getting close the the GSP versus Koscheck fight on Saturday, December 11th, I thought I would finish my series on The Ultimate Fighter 12. The two fighters that survived to the finals on TUF 12 were Michael Johnson and Jonathan Brookins. Both fighters were on team GSP during the series. These two lightweights were really the class of the group, and were the two fighters that should have made it to The Ultimate Fighter Finale. Michael Johnson was born and raised in St. Louis Missouri. He wrestled, ran track, and played running back at Marquette High School. He went on to attend Central Methodist University, but switched to Meremec Junior College where he joined the wrestling team. 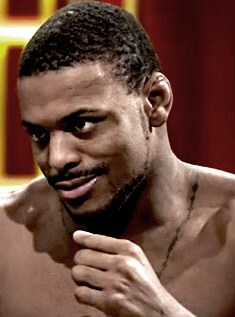 After graduation, Johnson joined the Springfield Fight Club to continue his interest in mixed martial arts, and had his first professional fight in February of 2008. Johnson had tried out for The Ultimate Fighter three previous times, but at age 24 finally made the cut. He is very athletic and has made the most of his opportunity. Jonathan Brookins grew up in Portland, Oregon. He loved sports, but was not a natural athlete. Brookins played football, and attempted to play basketball at Century High School. When he was cut from the basketball team, it led him to the wrestling mat where he excelled instantly. He was runner-up his junior year, and became state wrestling champion his senior year. Brookins earned a scholarship to Lindenwood University in St Louis, but was eventually expelled. Not knowing where to go or what to do next, Brookins moved back with his family in Florida where he became interested in MMA. He is an excellent wrestler, and a good student of the game. Round two started with Michael Johnson connecting with a left to the chin of Brookins at 4:48. Immediately after that, Brookins went for another takedown, and after an 8 second struggle ended up successfully on top of Johnson. With the advantage, Brookins immediately started throwing bombs to the head of Johnson, and this is where the fight turned. Brookins continued to throw punches and elbows to the head of Johnson, while maintaining top control for over three minutes. Johnson got back to his feet, but was up against the fence, and Brookins eventually slammed Johnson to the mat with a one leg takedown. That’s where the last 50 seconds of round two ended, Brookins on top of Johnson. Brookins seemed to have caught his wind this round. Round three started again with Johnson connecting with a right to the face of Brookins at 4:48. Again, immediately after, Brookins takes a leg of Johnson and gets Johnson against the fence. After 2 minutes 48 seconds of struggling to pull Johnson away from the cage, Brookins ends up mounting Johnson with 3:00 left. As Brookins was trying to get Johnson flat on his back and away from the cage, Johnson pulled off a reversal, and they were back on their feet at 2:31. Brookins got in a clinch with Johnson and used the leverage of the cage to throw Johnson back down to the mat. Brookins landed on his back, but was able to roll over and end up on top of Johnson, and in control. That’s where the last 2:20 of the match remained. Johnson could not excape from under Brookins, and was not skilled enough to even attempt any submission holds. The end result was Brookins winning by a unanimous decision, 29-28, 29-28, and 29-27. Congratulations to Jonathan Brookins, who wins The Ultimate Fighter Season 12 Champion in a tough battle against Michael Johnson. Now I can’t wait to see GSP take on Josh Koscheck in UFC 124 in Montreal, Quebec this Saturday night, December 11th.